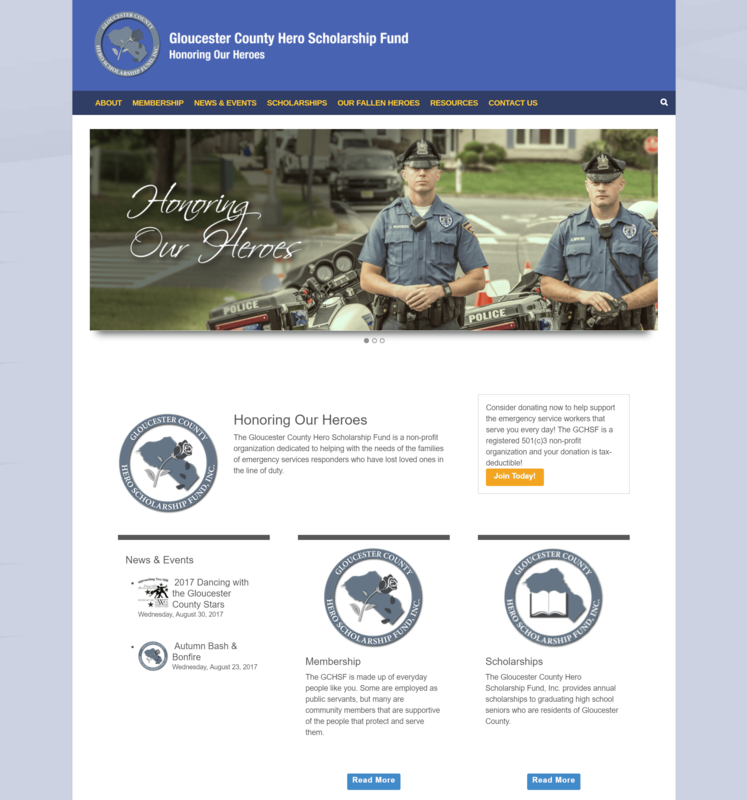 Market3 proudly launched a redesigned non-profit website for the Gloucester County Hero Scholarship Fund, Inc., located in Pitman New Jersey. GC Hero is a non-profit organization dedicated to helping the families of first responders who lost their lives in the line of duty. The organization was established in 1995 after it was found there was no financial support structure in place to assist the families of emergency personnel injured or killed while serving in Gloucester County. Today, GC Hero focuses on three different charitable aspects. Providing help with medical expenses of a line of duty death, assisting those with a prolonged absence from occupation due to extended recovery, and assisting the children of personnel killed in the line of duty to continue on to college. As a veteran-owned company, this organization is very important Market3. Our New Jersey Web Design Team understands the importance of having a website that fits the client’s needs. GC Hero’s site called for a simple interface that showcased the importance of their mission – providing help to fallen first responders man. Market3 fully customized GC Hero’s website on WordPress platform. This provides the client full updating capabilities due to a content managed system (CMS). There is no need for any third-party software when it comes to updating a WordPress website. After training, the client can update the site’s content and upload new photos and videos to the resource library on their own. Since Gloucester County Hero Scholarship Fund’s goal is to serve the public of Gloucester County, they needed a better user interface. When our New Jersey Web Design Firm redesigned their site, our goal was to create a better user experience. Through an extensive membership system, potential members are able to sign up and make donations through the website. When Market3 created the new website, we added a prominent news and events showcase. This section provides more exposure to upcoming events, fundraisers, and other important news announcements to visitors. The website also interacts with GC Hero’s social media presence, an important feature in today’s multimedia world.